Prepare the polenta-a choice between the yellow, uncut, with buckwheat, white-according to guidelines: the traditional one requires ca. 40 minutes to cook in salted water (for those in a hurry there are also precooked). Be sure to mix it often, possibly again and again, so that the flour doesn't make lumps. 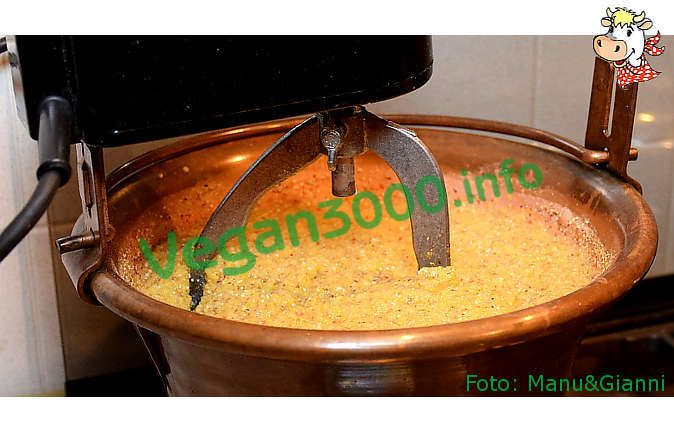 To prepare a Traditional polenta flawless recommend the use of the electric pot for polenta. Meanwhile, prepare the mushrooms: pour a little oil in a large pan, sauté the finely chopped garlic cloves where you will end and that you'll add the mushrooms already peeled and cut. Add salt and pepper to taste and cook from 10 to 20 minutes (depending on the quality of mushrooms that you used, if they are fresh or frozen, etc.). Just before you remove them from the heat, add a generous handful of chopped parsley (fresh or frozen) and stir. Serve on a bed of polenta and be careful not to make indigestion! ma se l'aglio lo si schiaccia e poi lo si tira via appena imbiondito non e' meglio, il gusto lo da' e nello stesso tempo non rinviene, o no? Io propongo di mettere insieme all'aglio, la famosa 'niepitella' o 'empitella'. Non so se il termine è giusto, ma è superlativa. A mio avviso lo zenzero, il timo o la noce moscata stanno benissimo con i funghi. Io mi sono permesso di aggiungere anche uno spruzzo di vino bianco.